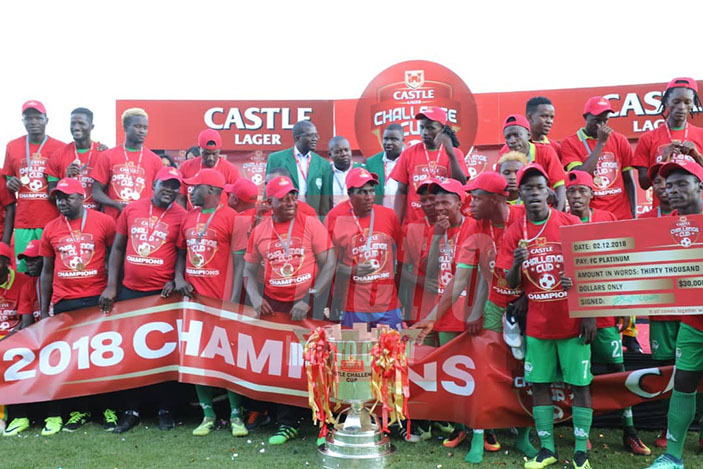 FC Platinum coach Norman Mapeza was delighted to see his side lifting the Castle Lager Challenge Cup with a 2-0 win over Triangle at Mandava yesterday. The competition, which is in its second edition sees league champions squaring off with Chibuku Super Cup winners. Both teams went into the match wishing to complete a double in the 2018 season. While Mapeza is basking in the glory of a double, focus now shifts to a Champions League preliminary round second leg encounter against Madagascar’s CNaPS at home on Wednesday. He is, however, worried about fatigue which saw captain of the day Kevin Moyo being pulled out due to cramps. Mapeza rested most of his regular starters, possibly ahead of Wednesday’s crucial encounter. A 0-0 draw is enough to see the Zimbabwean champions through to the next stage of the continent’s prestigious club competition. “My biggest worry was fatigue, you could tell and Kevin (Moyo) came off because of cramps. So that was my biggest worry but I am happy for the boys. “We just have to keep working hard because we have so much football to play after this game,” said Mapeza. The platinum miners scored in both halves through William Stima and Thomas Chideu. Mapeza is not carried away by the comfortable victory over the Lowveld side and calls for focus to finish off the visiting Indian Ocean Island side. “We just need to remain working hard, we just need to remain focused,” he said. Mapeza fielded only three players from the lineup that started in Madagascar, Kevin Moyo, Kelvin Madzongwe and Lawrence Mhlanga. Triangle coach Taurai Mangwiro said this shows how good the Zvishavane-based side is. The Sugar Sugar Boys were denied by the woodwork three times and Mangwiro rued poor conversion in front of goal. “Allow me to congratulate our opponents for the good season that they have had. “The difference is conversion, FC Platinum were lethal in front of goal. “They are a very good side considering that today (yesterday) they gave a run to players who have not been playing, it shows that they are doing well. He (Mapeza) has managed his squad well and maybe that was the difference,” said Mapeza.